What a night! Cornellians celebrated Zinck's Night at Collision Bend Brewery on the East Bank of the Flats last Thursday. Over 40 guests represented classes from 1967 to 2016 including one Californian visiting The Land and two past club presidents. Plenty of stories were shared including a few "back in my day," several "remember that time," and a couple "I can't believe we..."
And best of all, CCNEO connected with almost a dozen new faces and future volunteers. Thanks for a great evening! "Remember that time at Ruloff's...."
What a night! The Cornell and Dartmouth Clubs packed Cleveland Brewery on Saturday night. Cornellian owner Mary Tisi hosted as the Big Red and Big Green came together for a night at one of Cleveland's newest breweries. Friday night January 27th over 30 Cornellians gathered at Hansa Import Haus to cheer on the Cornell Big Red men’s hockey team as they took to the ice against the Harvard Crimson. The Big Red Faithful brought a Lynah atmosphere to Lorain Avenue but our team came up a bit short in the contest. It was great to see so many Cornellians out and enjoying the game and welcoming a few new faces to Cleveland. Two great events this past week. On Thursday, Cornellians gathered with the extended Ivy+ family at Magnolia Donuts. At the new Flats East Bank complex, Magnolia Donuts is a real donut shop out front, and a speakeasy lounge behind the secret door. Once inside alumni enjoyed a laid-back private mixer in the evening before the lounge slowly transformed into a lively nightclub. A great night to see Cornellian friends and make new friends from other clubs. Saturday switched gear at the Ozanam Food Center at St. Philomena Church. Part of the extended Cornell Cares program, local alumni worked vegetable distribution and prepared produce for those in need. This was the first of two volunteer days at Ozanam, the next on Dec 24th, leading up to the official global Cornell Cares day on January 7th where CCNEO will host volunteers at the Cleveland Food Bank. See here for more information. How many pounds of potatoes does it take to make one pound of chips? A beautiful day for a run at CCNEO's Homecoming Virtual 5k. What does a Clevelander have to do with the Cornell Medical School? And how might Ezra Cornell be connected to the founding of the cemetery? Just some of the things we learned on our tour. 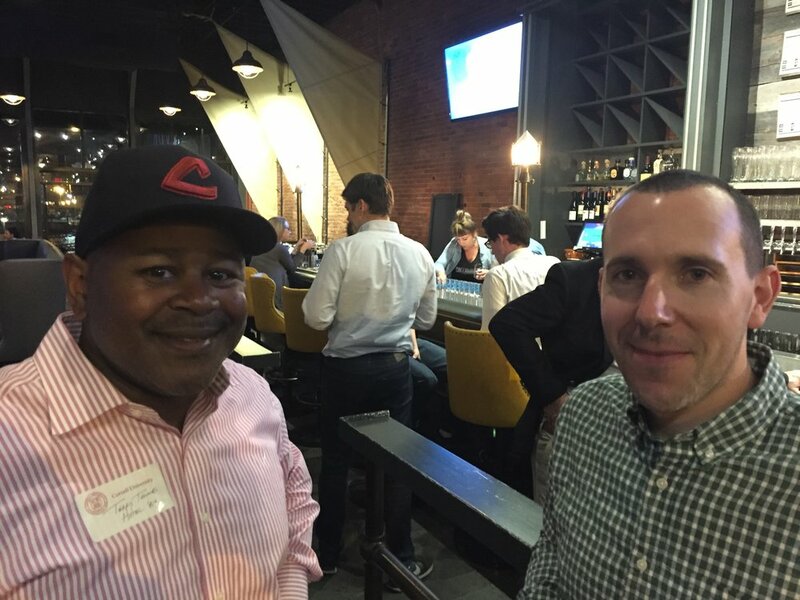 Our mission is to foster communications and growth between Cleveland and Cornell by promoting Cornell to our region’s students and foster networking, both business and social, between alumni of all ages in the Northeast Ohio region. We aim to enhance regional community, economic activity and education for our local alumni and to raise awareness of Cornell in Cleveland and awareness of Cleveland at Cornell.